There is a previous blog post about cracks in jade bangle bracelets. 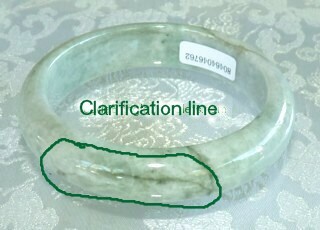 The post mentioned "clarification lines", and readers have been asking for more information about clarification lines in jade bangle bracelets. I recently watched an episode about gemstones throughout the world on National Geographic station. They did a very good informative part about jadeite. The program showed how gems were formed, by the earth's heat and pressure during its formation, and the impact of natural happenings on gemstone formation. And the segment explained clarification lines in jade better than I have heard it explained to me in China. In China, the jade experts always dismissed my concerns about clarification lines as "just natural". The program showed jadeite being formed, the tremendous amount of heat and pressure. It showed when the stone was cooling, if an area was fragile, nature strengthened it by adding more elements that turned into lines when the gem was finally formed. Instead of being a crack that may cause the jade to be more fragile, the clarification line shows that strength was added to the stone. Customers would often complain about the "crack" in their jade bangle after they purchased it, so for quite a few years I would list the bangles with the clarification lines in Clearance with a great discount. And I noticed it was mostly Chinese people who bought them. They probably were thrilled to get the great price, and laughed at me for letting them sell so cheaply. I also noticed when I wore the jade bangles that had the clarification lines, they never broke even when I accidently struck them hard on a counter top, or hard surface, while my "perfect" jade bangles sometimes did break under the same circumstance. A clarification line will be seen as a line that runs through the the jade. A crack line runs up and down as you can see on photos in the previous blog post mentioned. Sometimes they are inside the jade and can't be felt, but they can also be on the top of jade, where you can feel it, and it does feel like a crack. Jade carvers know how to carve their jade bangle to use clarification lines to their advantage, to use the strongest part of jade stone where there is the highest risk of it being in danger of getting struck. I still have customers who ask me for jade bangle bracelets with the clarification lines. They may not understand the purpose of the clarification line, but they like that natural-ness of the jade bangle. I respect these customers as true jade lovers. And I do often discount jade bangles with clarification lines to give these natural jade lovers the advantage of a good price on genuine, natural jade.